​The Arctic is a relatively undeveloped portion of the world. As local communities and investors, developers and governments look to increase development in the region, they must weigh some difficult choices. Development may bring prosperity, but it also brings impacts on local environments and people. 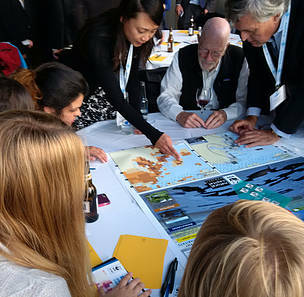 Northland: Arctic Choices is a game designed to illustrate some of the benefits and costs of development decisions. Number of players: ideally 2-8 per group, but can also be played solo or in larger groups. Playing with several groups at a time can both sharpen the competition, and create an opportunity for different discussions and insights from the different groups. Each board consists of four map panels. Print 1 board per group. Use the calculator to determine the scores for each round. Reflections from the game – what did you learn? How did it make you feel?